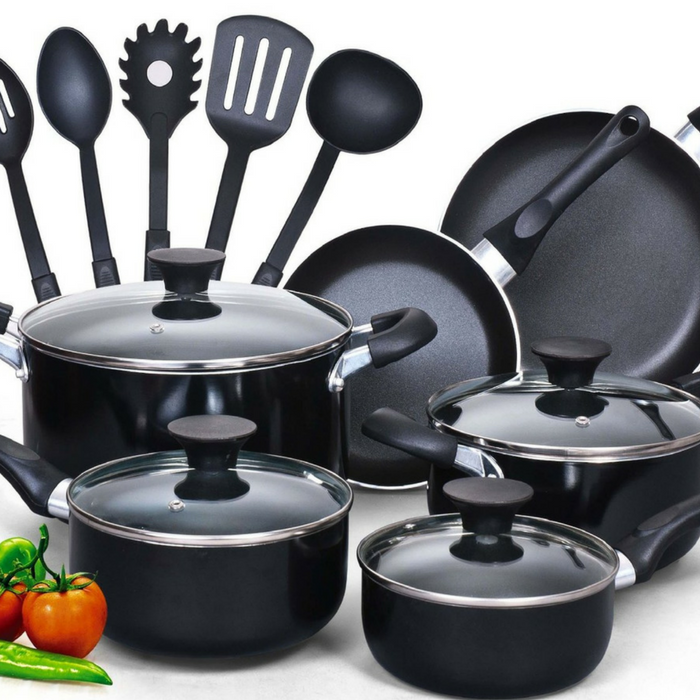 15-Piece Nonstick Cookware Set Just $45.99! Down From $70! PLUS FREE Shipping! You are here: Home / Great Deals / Amazon Deals / 15-Piece Nonstick Cookware Set Just $45.99! Down From $70! PLUS FREE Shipping! Amazon is currently offering this 15-Piece Nonstick Cookware Set for just $45.99 down from $69.99 PLUS FREE shipping! The Cook N Home 15-Piece Nonstick Soft Handle Cookware Set is made of thick gauge aluminum that provides even heat conduction and prevents hot spots. Nonstick coating makes food release/cleaning easy and allows for healthy cooking. Tempered glass lids with steam vent for viewing food while cooking. Lids fit on fry pans. Silicone soft touch handles are comfortable, stay cool, and non-slip. Utensil set includes: spoon, slotted spoon, pasta server, ladle, and spatula. Great for personal use or for a gift! Tempered glass lids makes viewing food easy from start to finish. Nonstick coating provides long lasting superior Non-stick performance. Soft touch handles stay cool when cooking, anti-slip silicone on handle make it comfortable. Heavy gauge aluminum is super conductive for even heat distribution.